Swipe to find your next Nissan. 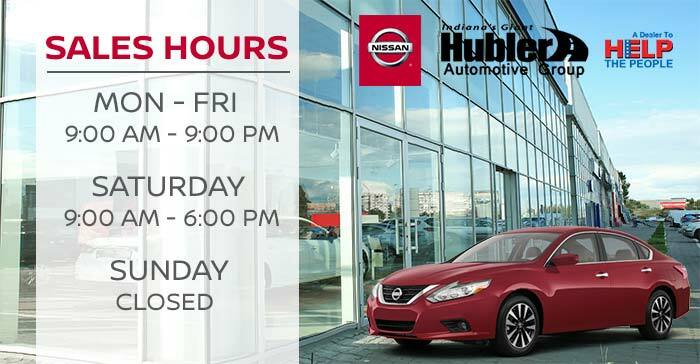 Welcome to Hubler Nissan, Indiana's #1 Nissan Dealer! Our full-service Nissan dealership is well-known throughout Indianapolis and the Columbus, IN area for offering a large selection of new Nissan vehicles and used cars for sale. As a full-service car dealership in Indianapolis, we also provide local drivers from Greenwood, Franklin and beyond with new and used car financing, plus top-quality auto maintenance and repair service and genuine Nissan parts for sale. When you are looking for a new Nissan or quality pre-owned vehicle for sale near Franklin or Greenwood, IN, turn to Hubler Nissan. We provide comprehensive automotive services, from the purchase and financing of your new vehicle to the routine maintenance and parts you will need down the road to keep your car performing at its peak. While we serve the greater Indianapolis community with our many automotive services, we are also proud to support local causes and organizations, including as an IUPUI Athletics sponsor and supporter of the Indianapolis Police Department and Toys for Tots. Visit us in Indianapolis, IN today! 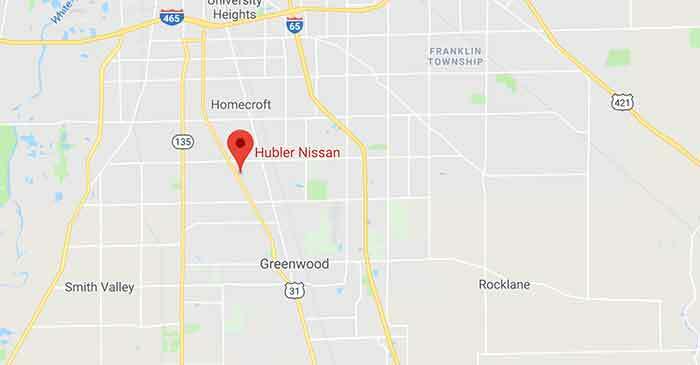 Get Directions to Hubler Nissan, INC.
Our Nissan dealership in Indianapolis, IN carries the complete lineup of new Nissan models in a variety of trim levels and configurations for your to explore. From a new Nissan Sentra or Altima sedan to the latest Nissan Rogue or Murano crossover SUV, you can find your next vehicle here at a great price! We provide fair and transparent pricing on all of our vehicles for sale! As a Nissan Commercial Vehicle Dealer, you can find that new Nissan Titan or Frontier pickup or a Nissan NV Cargo or Passenger Van at our dealership today! Local car buyers near Columbus, IN can also turn to our dealership for quality used cars, SUVs and pickup trucks for sale. We carry over 1,200 used cars for sale from Nissan and many other popular automakers at any given time! For added peace of mind when buying a used car, we also stock a stellar selection of Nissan Certified Pre-Owned (CPO) vehicles, as well as certified pre-owned cars backed by the Q-Certified Warranty from Hubler. Plus, with our current used car specials and pre-owned cars priced below $10,0000, drivers of all budgets can find a quality car to drive here at Hubler Nissan! Financing your vehicle purchase is hassle-free when you work with the team at Hubler Nissan. New and used car buyers of all credit levels can find support and assistance here at Hubler Nissan! We even work with used car buyers who possess less than perfect credit, so no matter your current situation, do not hesitate to apply for auto financing at Hubler Nissan today! Local car buyers near Franklin, IN can explore current Nissan lease specials and finance offers here on our website to ensure they get the most favorable financing rates or lease deals! Our team of Nissan factory-trained and ASE Certified technicians have got you covered whenever your Nissan is in need of maintenance. Whether you are just stopping in for an oil change, tire rotation or multi-point inspection or it is time for a factory-recommended service interval or brake service, our service advisors and mechanics are here to serve you! Schedule your car's next service appointment online or call us today! Our service staff utilizes genuine Nissan parts to ensure your Nissan's factory warranty remains intact and that your car remains 100% Nissan! Whether you are planning at-home auto repair or visiting our service department for professional maintenance on your Nissan, using genuine Nissan parts is always a smart choice. Only authentic OEM Nissan parts and accessories meet the strict standards of your vehicle's manufacturer, ensuring that each component is quality-built and provides proper fit and function. Local Nissan drivers around Greenwood, IN can visit our parts team or order Nissan parts online through our website. Reach out to our Nissan parts specialists for the expertise you need for your next Nissan project! While our full-service Nissan dealership is conveniently located for Franklin and Columbus, IN area drivers, you can access many of our automotive services here on our website before your visit. For instance, you can view the latest Nissan finance and lease offers, schedule a test drive, see the trade-in value of your car and much more -- all from our website! Our goal is to make shopping for a new car or obtaining the auto parts or service your car needs as convenient and stress-free as possible. Explore our website further and contact us with any questions!